The outdoor explosion occurred at 135 23rd Street, between Sixth and Seventh avenues in New York City, outside the Associated Blind Housing facility that cares for the visually impaired. At least 29 people were injured in the blast, with one person suffering serious wounds. Twenty four people with non-life threatening injuries were transported to local hospitals. Police spokesman Stephen Davis said the explosion is believed to have originated inside a trash bin, NBC reported, stating that the FBI Joint Terrorism Task Force is at the scene. The Federal Bureau of Alcohol, Tobacco and Firearms and New York arson and explosives task force are also at the scene. The New York Office of Emergency Management said it was also responding to the incident. At least two buildings were evacuated in the vicinity of the incident, but no fires have been reported, the NY Post segment on the incident says. The FDNY also says it has had no impact on subways and trains going in and out of Penn Station at this time. Facebook meanwhile has activated its ‘Safety Check’ feature so that social media users can notify their loved ones of their safety. Twitter users, citing the police scanner, alleged that the blast could have been caused by an improvised explosive device. PIX 11 also reported that the blast was due to a pipe bomb that had been placed in a garbage can in Seaside Park, New Jersey. 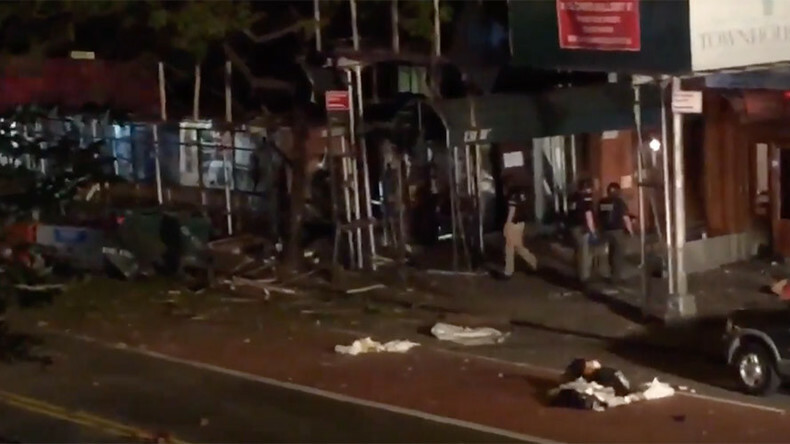 The NYPD Counterterrorism Unit is now at the scene, while witnesses report on Twitter that police are conducting searches in the vicinity of the explosion, checking for possible secondary devices. Emergency scanner audio indicates that the incident is being treated as a 10-60 (Major Emergency). The FDNY is at the scene with the NYPD in Chelsea, a neighborhood on the West Side of the borough of Manhattan in New York City. Emergency crews arrived at the about 8:30pm, a witness and FDNY spokesman told NY Daily News. Earlier on Saturday at approximately 9:35am, an improvised explosive device went off in Seaside Park, New Jersey, just ahead of a 5km US Marines charity race that saw some 5,000 runners participate. The bomb, which only partially detonated, caused no injuries. Authorities are yet to make any connection between the explosions.